Instagram marketing is hard work. While many of us obsess about racking up the followers, likes, and comments, for others it just seems to come so naturally. My good friend, Shannon Sleeman, is one of those people. She seems to have mastered the art of building a loyal following on Instagram. She has created and grown not one, not two, but three separate Instagram accounts, amassing thousands of loyal followers for each. 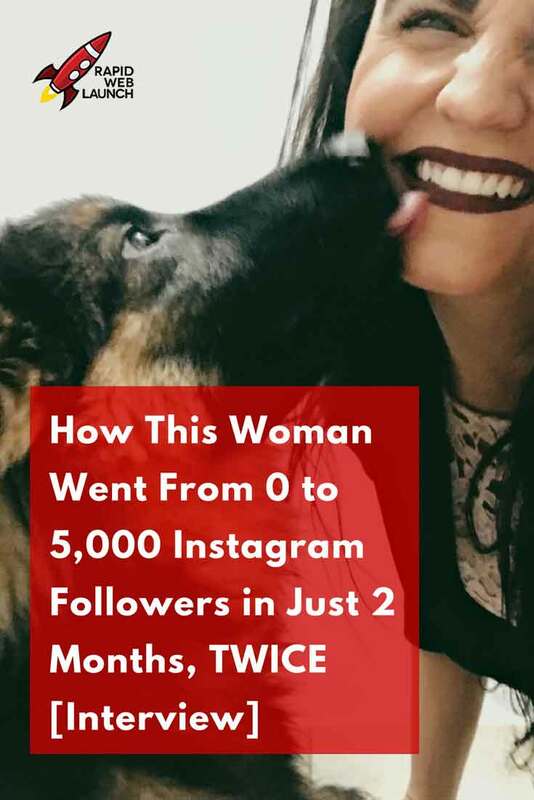 Each time she told me she started a new account, and then casually mentioned how she managed to get thousands of followers in just a couple of months, I was floored. She made it look so easy. For someone who is heavily involved in marketing, I was fascinated. I needed to know more. Below is our discussion. The questions came from me, and all of her answers are in her own words. Why don’t you start by telling us a bit about yourself Shannon? Well, where to start. I’m 29 years old, and have been married for 5 years. I love photography, being outdoors, reading, and animals. A couple months ago, I went through a really tough patch, and tried to take my own life. I ended up staying in the mental health unit for a bit, and was diagnosed with borderline personality disorder, along with clinical depression. Due to my diagnosis, especially borderline personality disorder, I’m hoping to do everything I can to bring awareness to it, and erase the stigma that surrounds it. Wow, thanks for sharing that Shannon. I know that was hard for you to do. I’m sure everyone else who is struggling with similar illnesses will appreciate it greatly. Thank you. I appreciate you letting me ramble on about it. I find talking about it to be more therapeutic for me, and if it helps others to open up and realize they can always come to me, I’m OK with that too. So, what do you love about Instagram? What keeps you coming back to it? I love the interactions, I love photography, and I love dogs, so, Instagram is a place where I can be a part of all those elements. As well, I take scenery photos because it brings me peace, and photos of Nova, in order to watch her grow. So, just as these things bring me joy, I like sharing it with others. How many Instagram accounts have you started (and grown) now? Over the past three years I’ve had three fairly big Instagram accounts. My current ones are @wandering.nova, and @wildfoxandflowers which is currently deactivated, but may make a comeback soon. Up until a couple weeks ago, I also had my @beautifiedrealism account but chose to delete it permanently. I’m now working on my @nova.and.moose account on top of @wandering.nova. So you’ve built THREE successful Instagram accounts when most people would be happy with just one… Nice! Why did you delete them when they were so successful? Well, it usually either got to be too much, or I lost interest. As I mentioned, I recently found out I have a couple of mental illnesses I’ve been contending with my whole life but didn’t know, so, at the time all I knew was that trying to keep up with the constant responses, interactions, and having to leave the house to take photos got to be pretty draining. My BPD also causes me to fluctuate in my passions so, while taking photos has always been what provides me solace and rare happiness, getting out to take them can be difficult. Or I just simply don’t care enough to try. When those moments came, I’d delete my accounts. Then, once I felt better, the need to share my love of photography resumed, and I’d reactivate them. Ah. Then it’s a good thing you can always restore them when you want! What’s the formula for your repeated success on Instagram? The biggest thing is, interaction, interaction, interaction. Make sure you are following people and interacting with them. Respond to their comments and like their photos. And don’t just use cliche responses, be genuine. Definitely stay away from “follow for follow,” or “check out my page” type comments. Most substantial Instagramers won’t appreciate it. I also make an effort to learn from others. I ask questions when possible, and implement strategies that I see working for them. And, I always make sure to be myself. People respond better when you allow your personality to shine through, and don’t just treat them as someone to get likes or follows out of. Well, you’ve always been a very genuine and caring person, so I totally get why people are drawn to you. That’s awesome. How did you find the right hashtags to facilitate new interactions? Always go by what it is you’re trying to accomplish, and what kind of audience you’re trying to attract. For my photography account, I make sure to use hashtags that relate to that, but that also attract high quality users. Ones that don’t follow just to follow, but enjoy interacting, since that is one of the joys of Instagram for me. I like finding people with the same passions that I share, and who also enjoy commenting back. It makes Instagram fun. As for Nova’s account, I do the same, look for hashtags that attract fellow pups, especially ones of the same breed. Automatically, you know you’ll have something in common. One good way to choose the right hashtags to use would be to look for accounts that like to feature photos, especially ones with high follower counts. Also, keep an eye on the bigger accounts and what kind of hashtags they use. I tend to go for more scenic and photography based accounts, so I use hashtags catered to that. Two prime examples of that in the dog Instagram world, would be @bestwoof or @thestatelyhound, accounts that feature high quality and photography style shots. That’s a lot of great advice! How did you determine what content would resonate with your audience? I keep an eye on what Instagram posts gets more engagement because, while it’s not my prime focus, likes do get you noticed. I found with my first photography account that, while I loved portraits, what got more interaction was sunsets, and other landscape type photos, so I focused on posting more of those. For Nova, it doesn’t matter. haha Everyone loves puppies. True. That. How did you get noticed by Instagram influencers? I make good use of profile tagging, and hashtags. I make sure to constantly comment on their accounts, and reach out when possible. Also, once Instagram’s algorithm changed, the big influencers began to use pods. Once I found out about them, and their benefits, I started a few of my own. It allows a group of us to encourage one another, comment, like, and just share our experiences. Uh, wait a second. What’s a pod? A pod is a group chat comprised of between 10-15 accounts. Every time we post a new photo we send it to the group, and everyone goes and likes and comments on the photo. This way we are able to help boost engagement and, with the way Instagram’s algorithm is set up, our post doesn’t get lost under others that may naturally have tons of comments and likes due to more followers. I sort of took this idea a bit farther last week by creating a group on the Telegram app. It has the same idea, but the chat for the pod allows much more than the 15 on Instagram. I also created a photography chat group, so that those who would like to know more could ask questions, share tips, etc. I’m quite happy with how well it’s been going, so far we have about 80+ accounts, and we are thinking of doing biweekly photo challenges, an Instagram feature account, and more. The possibilities are endless! Did you make any mistakes? How do you avoid repeating them? Thankfully, I learned pretty quickly and, with the kind advice of bigger Instagramers, I discovered what worked and what didn’t. I really appreciated that! So, I try and do the same for others. I make sure to be open, and engaging. I try not to shut myself off from people, and let them know I’m available for questions and so forth. Being personable is definitely better than focusing on just numbers and growth. You can have a massive following but, if you don’t interact with people, it begins to lose meaning. You’re still a human being. Your accounts have had quite different audiences. Did you have to change the way you use Instagram for each one? I try to implement the same guidelines no matter what my content or audience may be. Like they say, if it ain’t broke, don’t fix it. It hasn’t failed me yet! If you could only offer one tip of advice for marketing on Instagram, what would it be? As cliche as it sounds, be yourself. Don’t try and change who you are. People like interacting with people. Don’t treat them as just someone that gives you likes, or gets your following count up, but actually take an interest in them. You’ll be surprised how far that goes! As I’ve mentioned, I was diagnosed with certain mental illnesses. Because of this, I started self harming to deal with the frustration, confusion, and emotional pain. To help me cope, and provide me comfort and support, my parents and my husband decided to get me a puppy. Cue Nova. She has honestly been my little life saver. I had a couple breeds in mind, but GSD’s have always been my favourite. I did tons of research and came across a breeder who specialized in long haired German shepherds. We went to take a look, and I immediately fell in love. So, of course, once we got her home and I started taking photos, I decided to start her own page. In the process of following my above guidelines, I realized I may qualify for a psychiatric service dog, so I started looking into that as well. It’s been an interesting process but, between training and taking photos of her, it’s something I don’t think I can ever lose interest in. Everyday she does something new, and makes me laugh because of her little antics. Seeing how people interact with her, and the joy she brings into their lives, also makes me feel a sense of accomplishment. It reinforces just how special dogs are, and reiterates why, out of all my accounts, her’s has grown the fastest. I didn’t grow up with dogs, or any animal really, so I never understood the bond people could have with them, until she came into my life. Now, I couldn’t imagine my life without her. I’ve met Nova in person. I can attest to all of this. Thanks so much for sharing both your personal story, and your Instagram marketing tips with us Shannon! No problem! Thanks for having me.